It’s really important for iPhone fans to move their precious photos and videos which take record of their memories to computer, then to burn them onto DVD or save to U-disk or upload to Internet. Here I want to show how to transfer iPhone videos to computer using only wifi, then burn them on to DVDs for saving. Here I will use Wireless Transfer app for iPhone and Slideshow DVD Creator for Mac. Wireless Transfer app is a transfer tool which has Windows/ Mac/ iOS/ Android version, so you can use the app to transfer photos/ videos between computer, iOS devices and Android devices freely. Here we will use it to send videos from iPhone to Mac. Slideshow DVD Creator is a slideshow application which can create photos/ music/ videos to professional-looking slideshow quite simply, then burn it onto DVD with the built-in DVD burner. Of course, it also supports to encode the slideshows to MP4 or Mov video format, so you can also enjoy the slideshow video on portable devices or upload them to Youtube/ Facebook etc. 1. 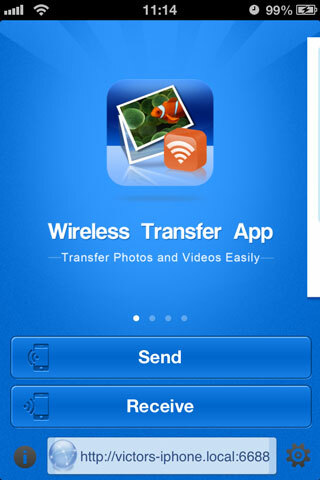 Download Wireless Transfer app to iPhone from App Store. Tap the button to launch it . Make sure that the iPhone and Mac are connected to the same wifi network already. 2. 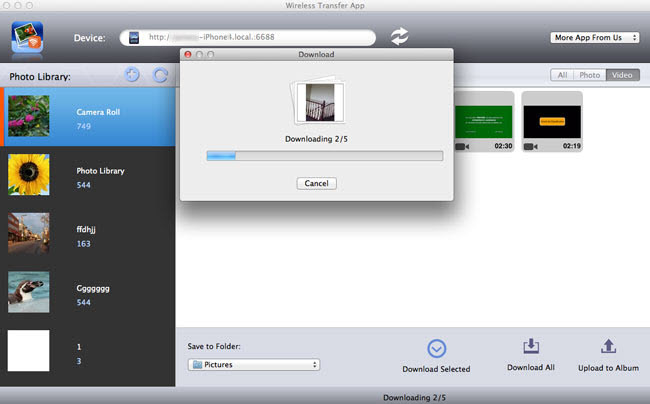 Download the Mac version of wireless transfer app from http://www.wirelesstransferapp.com . After launching it, click the box next to “Device” to connect the Mac with iPhone. 3. Then select the right album, and click the “Video” tab to show all the videos in the album, then click to batch download them. We can also specify the folder where the videos will be downloaded to. If you don’t want to install application on your Mac, you can also use browser to transfer videos between Mac and iPhone. Input the address you get from iPhone into browser of Mac, then select album and choose videos to download. Both ways are simple and convenient. 4. 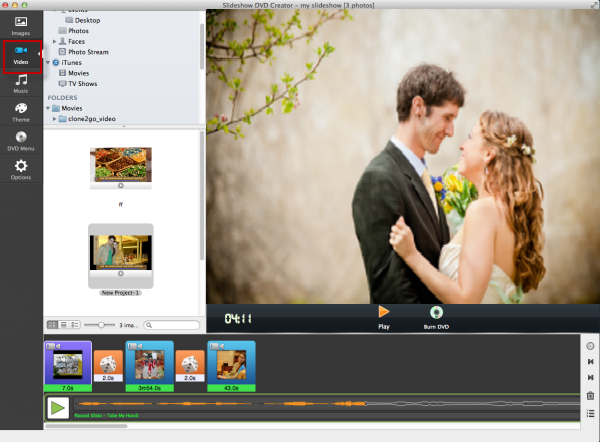 Next download Slideshow DVD Creator to Mac and launch it. 5. Click the “Videos” tab, then drag the videos you just downloaded to the bottom panel directly to add them. 6. There are DVD menu, title, theme, pan & zoom effect, duration you can set to the videos, but here we just burn them into DVD directly. So click “Burn DVD ” to burn them. This entry was posted in slideshow dvd mac and tagged burn iphone videos dvd, iphone videos dvd, send iphone videos mac, wifi iphone vidoes mac on April 2, 2014 by Sarah Jablich.